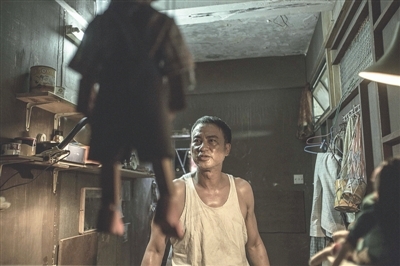 A two-part Hong Kong horror feature adapted from a group of stories by Lilian Lee. Consisting of three short films, the first segment is called Stolen Goods, directed and acted by famous Hong Kong actor 任达华 Simon Yam. Yam himself plays the lead role of a poor man who is unfortunately unable to hold down a job for very long. Living in a small room filled with dolls and children’s toys that he regularly talks to, things take a turn for the worse when he finally resorts to grave robbing, stealing urns and demanding ransom from the immediate families. The second segment, A Word In The Palm, talks about Tony Leung Kar-Fai, who plays Mr Ho, a fortune teller who sometimes sees ghosts, and Kelly Chen, who plays a bubbly and loopy mystic who’s just a few doors away from Mr Ho worked together to help a couple and a high school girl who drowned and came back to haunt the wife. The third story tells the story of a villain hitter, played by Siu Yam-Yam. People who want to wish ill on their enemies will usually go to a villain hitter and the villain hitter will then beat on a piece of paper (or better still, a picture) of said enemy, like a paper version of a voodoo doll, and bad things will happen to the enemy. Siu is visited by a ghostly looking young woman (Dada Chan)and is asked to hit four people – three men and a woman. 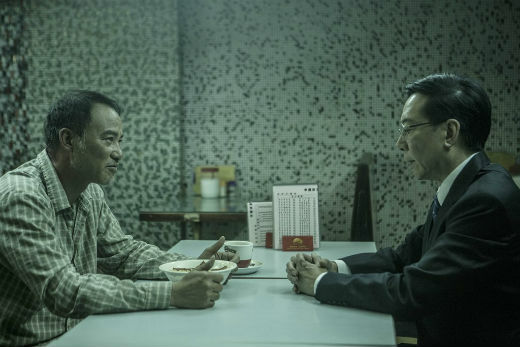 I would say, I respect Simon Yam’s for his great acting, being a low-income and poorly educated odd-job worker, suffering from the rising rents and prices, he portrayed the character very well. I will blame it on the odd andboring story plot, with random appearance of an obese ghost who keeps eating but says that he is full, two little girls locked out of their house and a fierce looking old lady. It made me wonder why am I in the cinema watching this disconnected film which made little sense. I guess the only funny part was the police man fainting when he saw the squashed body from a car accident. The second story kind of saved the film with Kelly Chen’s (surprising) comedic act in contrast to Tony Leung’s somewhat-serious character. The complete opposites shared great chemistry and I was surprised Kelly Chen isn’t just a vase or victim of the story. Some might feel that it is more of a funny ghost film than a scary one, but I was scared right at the start… but Kelly Chen herself. The story ended nicely with Leung and his family when his son revealed a secret his mother would hate to know. This is a story that is bound to leave you grinning. The third story was not my favourite, but it is good enough to get me thinking and interested in the Chinese culture of villain-hitting (打小人). It is a folk sorcery popular in the Guangdong area of China and Hong Kong. Its purpose is to curse one’s enemies using magic. 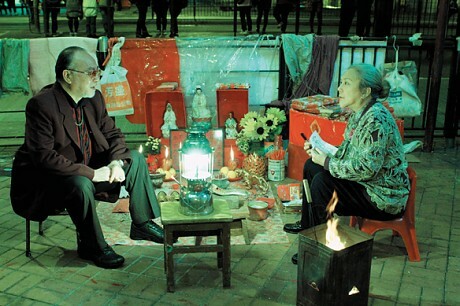 Villain hitting has been preliminarily included in the list of ‘Intangible Cultural Heritage’ by Hong Kong Home Affairs’ Bureau. The story shares more information about the culture while the story of a girl being raped and killed was unveiled in the process. The minus point was perhaps the exaggerating final-destination like actions when the rapists were one by one killed as the female ghost took her revenge by “hitting” the villians. This is the first film directed by veteran Simon Yam. Author Lilian Lee is known for her works Farewell my Concubine (霸王别姬) and Rouge (胭脂扣) with deceased actors Leslie Cheung and Anita Mui. 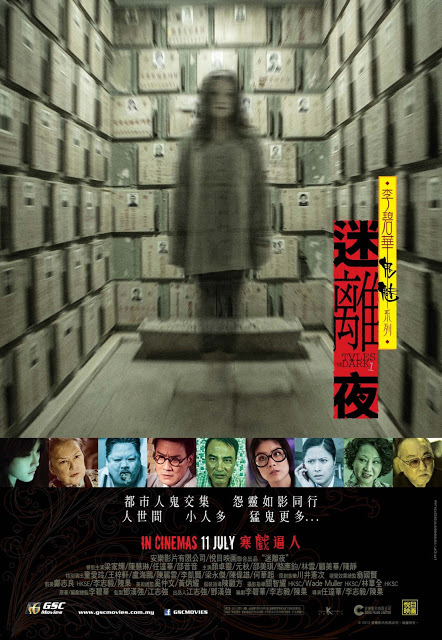 Tales From the Dark 1 迷离夜 will be in cinemas on 18th July 2013. For the review of (奇幻夜) Tales from the Dark 2, please click here. Tickets from encorefilms. No monetary compensation was received for the movie review.